Jewelry designer Janet Hill Talbert, a former book editor, channeled her love of words and devout Christian faith into an inspiring line of scripture jewelry. LoveToKnow recently interviewed Talbert about her jewelry company, On This Rock Jewelry, and the message behind her scripture jewelry. Janet Hill Talbert is a New York City-based jewelry designer. 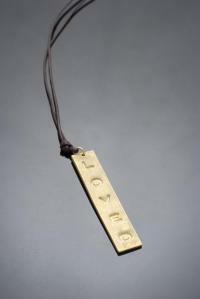 Talbert has created a collection of Biblical scripture jewelry using techniques such as wax molding, casting and hand fabrication. She works with metals, such as sterling silver, brass and bronze. Many pieces also include gemstones or natural objects like beach stones. 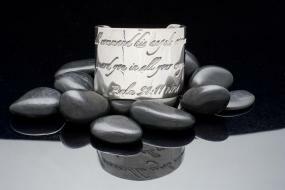 The On This Rock Jewelry collection includes necklaces and cuffs that feature Bible verses and prayers. After working as a successful book editor for Random House Publishing for two decades, Janet Hill Talbert discovered a rewarding new career in jewelry design. It all started with a walk on the beach and a trip to Israel. LoveToKnow (LTK): When did you first start designing jewelry? At what point did you decide to pursue a career as a jewelry designer? Janet Hill Talbert (Talbert): I am now married to wonderful man, but in the spring of 1999 I was in Nantucket at the wedding of one of my college roommates. I was single and alone in a sea of married people. The day of the wedding, I took an early morning walk on the beach and collected some amazing beach stones, and I thought, "Oh, you'll make jewelry out of these." The following week when I was back in New York, I bought some beads and went home and stayed up late into the night making necklaces and bracelets. The next day I sent one of the pieces that I made to my friend who had gotten married. I started out making jewelry for myself, but soon friends and family were asking me to make pieces for them as well. In the summer of 2000, I wanted to move beyond beading, and I took a week-long intensive class at the Jewelry Arts Institute in New York, a wonderful school that teaches classical techniques using silver and gold. I was in heaven! In 2008, I finally launched out on my own to pursue jewelry full-time. LTK: What is the story behind the creation of On This Rock Jewelry? Talbert: Following a marvelous, life-changing trip to Israel in 2000, I began to delve deeper into the Bible and read with renewed interest and passion because I had just visited many of the places that I'd heard about my whole life. As I read the Bible every day, certain scriptures would be illuminated, and I began to get ideas for jewelry. I started to make simple little drawings in my Bible. I didn't know what materials I would use, or how I would get the scripture onto the jewelry, so I started to make pieces out of paper first and then clay. One day following a walk near my parents' home in Michigan, "On This Rock" came to me for the name of the jewelry line. It comes from the scripture: Matthew 16:18. 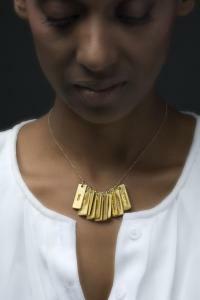 LTK: How has your book editing experience influenced your jewelry designs?Talbert: I have always been a lover of words. I was blessed to grow up in a house filled with books, and books have always provided me with great pleasure, either by providing solace, amusement or an escape. Being a book editor was a natural progression for me, and designing jewelry with words is equally as organic and allows me to use words to express the things and values that are important to me. LTK: You describe the cuffs featured in your collection as "kinder, gentler Wonder Woman bracelets." How do the cuffs represent this idea?Talbert: I remember watching the television show "Wonder Woman" when I was a child and being fascinated by the cuffs the character wore. She was able to wield power by putting her cuffs together and saying, "Almighty Isis." But true power comes from the Word of God, and so when I wear my cuffs, I feel like I'm armed with God's power and love. We are living in tough times, and I think that we should be armed with all the power we can muster. 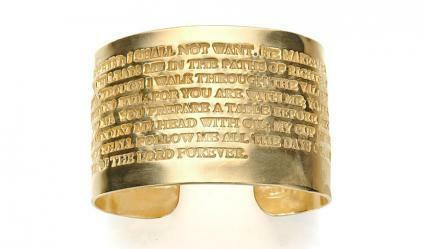 Wearing a cuff with scripture on it is a great way to do that. LTK: How do you use Biblical scripture in your jewelry?Talbert: The Bible is my favorite book, and I read it every day. It's a treasure trove filled with fascinating and wonderful stories, wisdom and knowledge. My Bible study teacher, Chris Burge, calls it "a 66-book love letter." 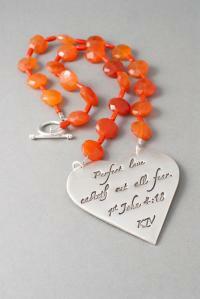 As certain scriptures speak to me, I try to incorporate them into the jewelry. One of the first pieces that I made after I figured out a technique to incorporate the scripture into the jewelry was the Fruit of the Spirit cuff. I fell in love with a scripture in Galatians 5:22-23 that reads: "The fruit of the spirit is love, joy, peace, patience, kindness, goodness, faithfulness, gentleness and self-control." Around the same time I made a necklace that consists of little tablets, each one bearing a "fruit of the spirit." I made my first one in 2002, and still wear it and am thrilled to now share it with our customers! LTK: What type of spiritual and inspirational messages do you convey through your jewelry? Talbert: The goal of the jewelry is for the messages to empower and create for the wearer a sense of well-being, support and love. The Bible tells us that God is love and also says that we are to "love our neighbors as we love ourselves." So it is my hope that On This Rock Jewelry will also be a way of reminding people that they are loved and, as the scriptures tell us, to "walk in love" and "live a life of love." Another of my favorite scriptures is Colossians 3:12-14 (NIV), that reads in part, "...clothe yourselves with compassion, kindness, humility, gentleness and patience...and over all these virtues put on love, which binds them all together in perfect unity." LTK: What do you hope people will experience when wearing your jewelry? Talbert: We are living in challenging times, and it's my prayer that people will feel comforted, encouraged and inspired by the jewelry, that the jewelry will provide meditative moments throughout the day and that each person will find solace and peace in the Scripture or the Biblical message in each piece of jewelry. To learn more about Janet Hill Talbert, visit her website, On This Rock NYC. Customers can purchase jewelry and find out the latest jewelry design news at the site. LoveToKnow thanks Janet Hill Talbert for the inspirational interview and wishes her great future success.